Temporary & Electric Fencing Poly Fence & Reels Polytape 660ft. 6-Tinned Copper Strands. 1/2 inch tape. Ultra conductive wires for maximum energy transfer. Temporary & Electric Fencing Poly Fence & Reels Polytape 1320ft. 6-Tinned Copper Strands. Ultra conductive wires for maximum energy transfer. Temporary & Electric Fencing Poly Fence & Reels Polytape 660ft roll - 1/2 inch wide - .16mm Stainless Steel Conductors - UV Stabilized for maximum longevity! Temporary & Electric Fencing Poly Fence & Reels Polytape 1320ft roll - 1/2 inch wide - .16mm Stainless Steel Conductors - UV Stabilized for maximum longevity! 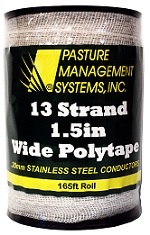 Temporary & Electric Fencing Poly Fence & Reels Polytape 165ft roll x 1-1/2in wide - .13 MEGA-STRAND Stainless Steel Conductors - UV Stabilized. Excellent Horse Fence. Temporary & Electric Fencing Poly Fence & Reels Polytape 660ft roll x 1-1/2in wide - .13 MEGA-STRAND Stainless Steel Conductors - UV Stabilized. Excellent Horse Fence.